A few weeks ago Steve Stafford wrote a blog post about the use of voids in families. It appears the Autodesk documentation for Revit recommends to “avoid voids” because of performance issues. I found this interesting as I tend to use this functionality a lot when making sure modeled objects cut each other as they should according to construction. The automatic joins and Join Geometry gives me pain in over 50 % of the situations where I need to do this, and when Autodesk introduced the “Cut with Voids When Loaded” option in the Family Editor they opened up a lot of efficient 3D detailing potential. Of course this requires that someone sets up all families with voids, and this can be tedious work. Especially with constraints (you want the voids to follow the same rules as you solids) and nesting. But once you’re done, the models can reflect reality way faster and more intuitive than before. 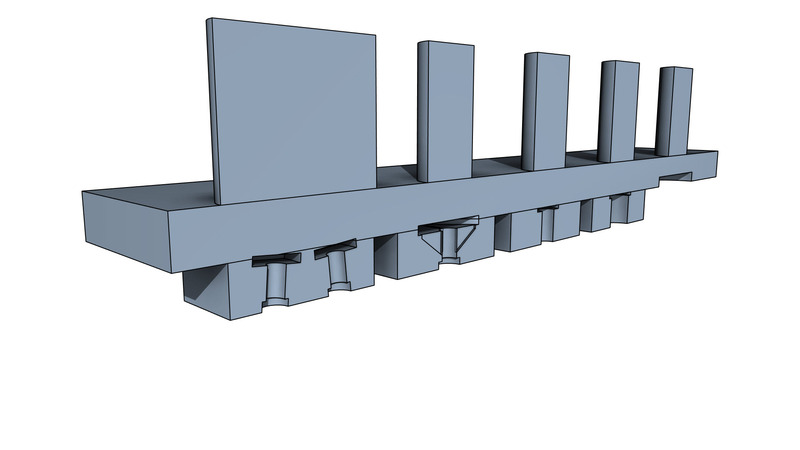 If you are into 3D Rebar, you will notice that using voids to cut will produce Rebar Cover references for your reinforcement modeling. That’s a good thing. I use this functionality on more objects than Structural Foundations. For instance prefabricated slabs embedded in cast in place structures, or columns cutting slabs with a tolerance. The options are endless. So, what does not work very well when you’re playing around with this? 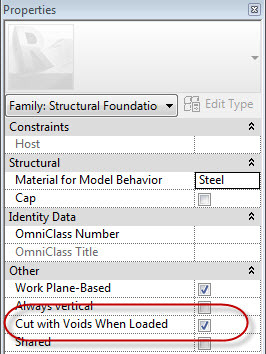 First, there is a graphical bug in Revit 2013 that occur “sometimes” when you do not use a voided family for cutting. In some cases Revit views will display the yellowish void instead of geometry. This can badly affect your drawings if you print with color, so beware. Second, you always have to Cut Geometry manually. There is no automated procedure to do this. Again though, the upsides are greater than the downsides. 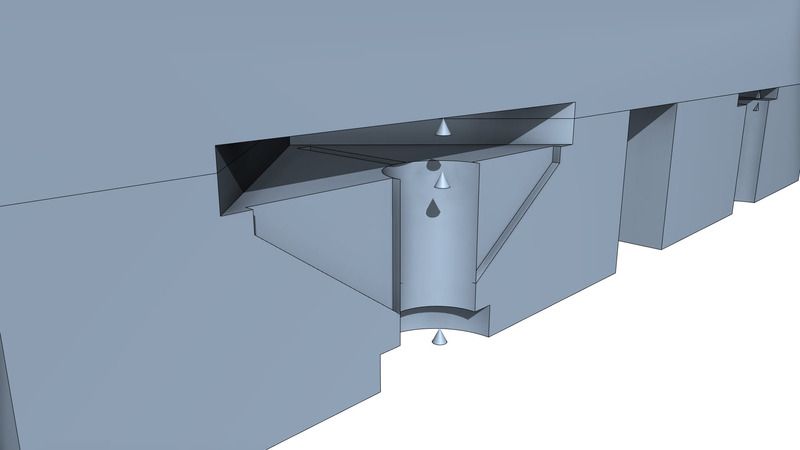 One can always hope Autodesk adds some new functionality in the future, and high up on my list is the ability to use family solids for cutting. The void cutting is okay, but in most situations I am looking for my solid geometry to cut something. An option to enable automatic cutting like in Wall-, Floor- and Face-based families would also be favorable. I’ve always thought Revit lacks a way to control the construction procedure of elements, and something like a hard coded “operation sequence number” (almost like Phases) could provide helpful. Try to imagine a cut priority connected to placement procedure. Pile = 1, Concrete Foundation = 2, Foundations Slab = 3, and so on. And the lowest number will always cut the higher number. From a structural and construction point of view that would make sense. Last I’d like to use this opportunity to show a small detail I’ve added to all our circular elements (foundations, columns and openings). It’s a tiny cone that is hidden by default in most view, but gets exported to IFC so that site engineers and land surveyors can use our models to pinpoint the concentric global position of each element. With the “avoid voids” mantra in mind, lets hope the Autodesk documentation needs a few revisions rather than my project models. Download one of the Steel Piles from Content. 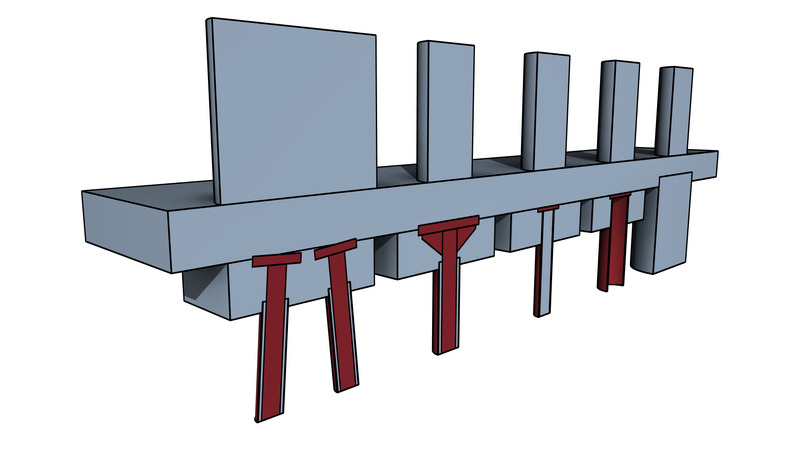 This entry was posted in Tips, Value and tagged Concrete, Foundations, Piles, Revit on March 11, 2013 by Håvard Vasshaug. I have used this same method to form profiled recess in concrete walls by creating a generic model family made of voids. However when you create a plan on the walls you cannot see the cut profile of the wall has hidden lines. Do you have a solution to this that does not involve drawing detail lines on the plans? Hi Alex. One of the first hacks I ever learnt in Revit was about extending the bounding box of an element, and adding Symbolic Lines in family. Paul Aubin described this in his book Master Revit Building ages ago. You basically open your void family, add Symbolic Hidden Lines along the edges and a parametric Invisible Line that extends beyond the plan cut planes you use. This will automatically produce hidden lines. You could also of course use the Show Hidden Lines functionality, but that require manual labor for every single view. I’m not a big fan of manual labor. Is it possible to use a void family in a solid family to creates cuts? I think so. I’d check the “Shared” tick box in case it didn’t at first. It would also be wonderful if a void or a solid could cut multiple objects at once. For example two plates connected with a bolt. The bolt would make sure both holes are in correct position. I don’t believe my own eyes! The legendary Forsmark is reading my blog 🙂 You can make a family with voids cut anything you want really. One bolt to cut two plates – no problem. Problem: if you do this, assembly for steel detailing will ignore the holes.